Rohan Gye’s recent blog 400 days of transformation has reminded us that many of the changes we’re delivering stem from the Red Tape Challenge introduced by government in April 2011. This gave business and the general public the opportunity to challenge the government to get rid of burdensome regulations. 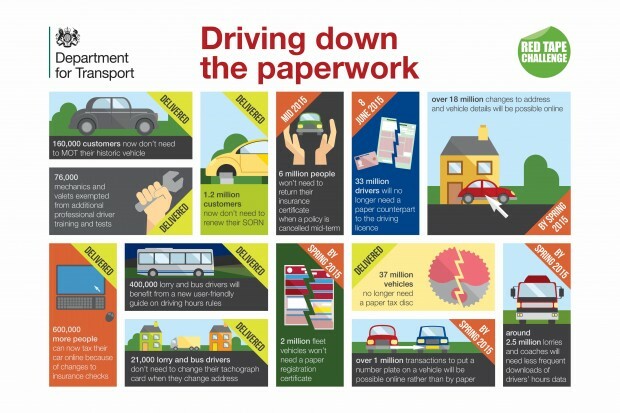 By December 2011, the Department for Transport (DfT) announced an ambitious programme of road transportation changes. This included our commitment to make services easier for motorists and business - to remove paper documents and increase the availability of online services - later to be known as ’DVLA’s paperless driving measures package’. Many proposals needed significant changes being made to our IT systems, with 3 being adopted as digital exemplars and others needing a change to legislation. This mammoth task involved the efforts of many including stakeholders, businesses, motorists, policy, project and IT officials, economists and lawyers. From the outset we recognised that all proposals required a deep understanding of users’ needs and that extensive engagement and collaboration was essential. It has been an ambitious undertaking to deliver so many changes. We’ve done a lot to understand users’ needs and to join services and information up as we moved along. Where possible we’ve taken an agile approach to introduce the changes and adhered to digital by default service standards. We’ve provided regular updates to DfT and Cabinet Office on legislative and IT progress on delivering our commitments. The outcome is we’ve delivered a significant package of change as part of the Red Tape Challenge but it wouldn’t have been possible without the efforts of everyone involved in the process. We’ll not be resting on our laurels and will continue to refine and expand the range of on-line services that will help to realise our goal to be Simpler, Better, Safer.